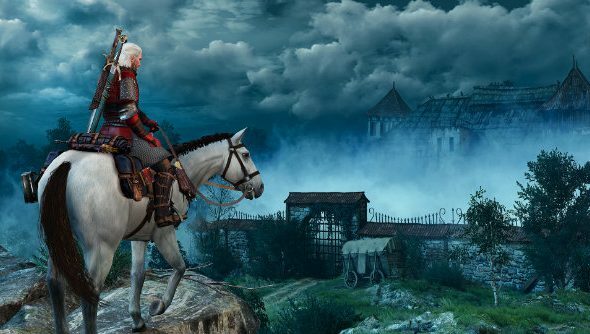 The Witcher 3: Wild Hunt’s first big chunk of DLC has launched today. If you’re looking for new characters, quests and equipment you can grab the expansion, called Hearts of Stone, for £7.99 on GOG. Looking to extend your play time even more? Here are the best Witcher 3 mods. I played the DLC for a couple of hours earlier and, in true The Witcher 3 fashion, I spent more time messing about with the new sidequests than I did pursuing the main plotline. From a brand new merchant I bought a regal-looking, sleeveless Sherwani with intricate embroidery. Paired with some Nilfgaardian guantlets, and with Geralt’s muscular, scarred arms on display, it gives him the look of a man who would read you poetry before smashing your skull into a rock. That didn’t stop the new and dangerous enemy types trying their luck though. I had an encounter with a giant spider that I barely survived and was set upon by a bunch of level 34 wild boars. The challenge has definitely been upped for this chapter in Geralt’s story. Despite that challenge, it just feels good to be back in one of the best games of the year again. Have you tried it yet? Let us know your (spoiler free) thoughts in the comments.